These positions are located in the French ‘Midi-Pyrénées, Pays de La Loire, Aquitaine and Lorraine’ Regions. They are aimed at developing technologies of the future and their transfer to industry as the thesis’s results will be integrated in pre-industrial demonstrators, therefore providing candidates with an experience in technology transfer. 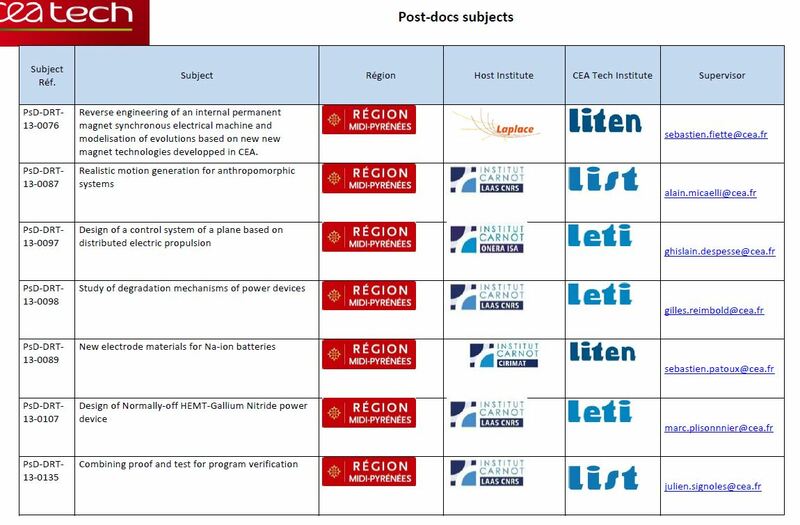 PhD and post-docs will be hosted in CEA Tech’s academic laboratories partners (CNRS, universities, “engineering masters”, Carnot institutes…), in the context of collaborative projects endorsed by industry on the basis of regional priority themes for economic growth. This announcement is part of the annual CEA Tech recruitment plan of over 200 PhD students and Postdocs per year. These PhD positions require at least a master degree (MSc) in physics, chemistry or engineering, acquired in world class universities or research institutes with experience related to the different topics of the program. The working language will be English. Knowledge of French language would be a plus. The post-doc applicants should have graduated a PhD degree in the same research topics, since less than 2 years. The host Institutes are located in the French ‘Midi-Pyrénées, Pays de La Loire, Aquitaine and Lorraine’ Regions. As they are involved in the world class research, they provide an international research environment with world class scientists and leading dynamic teams from CNRS, universities, “engineering masters” … as well as state of the art facilities for technologies, analysis and computing. 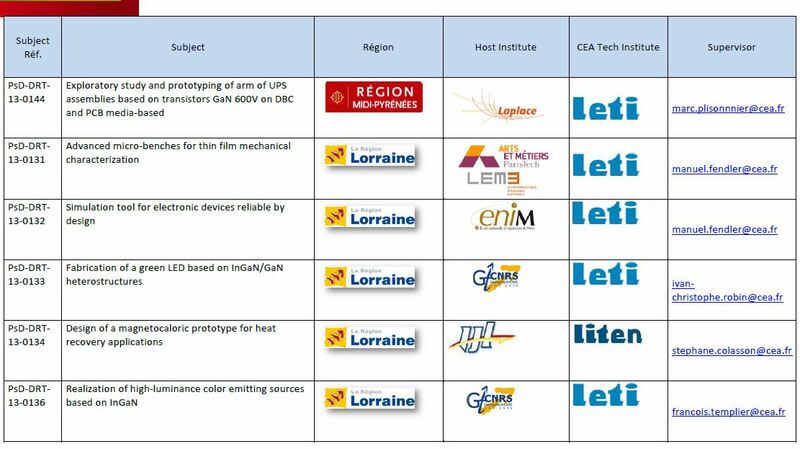 Approximately 20% of the the work will be done in CEA Tech institutes: LETI, LITEN, LIST, based in Paris-Saclay and Grenoble. Applicants should select one or more topics of the program and send their resume (curriculum vitae) with a cover letter, by email to the contacts listed here under. ← Groene kansen in Frankrijk?